“In the journal I do not just express myself more openly than I could to any person, I create myself.” So wrote Susan Sontag, quoted in the catalogue accompanying this thoughtful and engaging exhibition. She expresses one of the prime motivations for capturing and recording one’s daily existence. 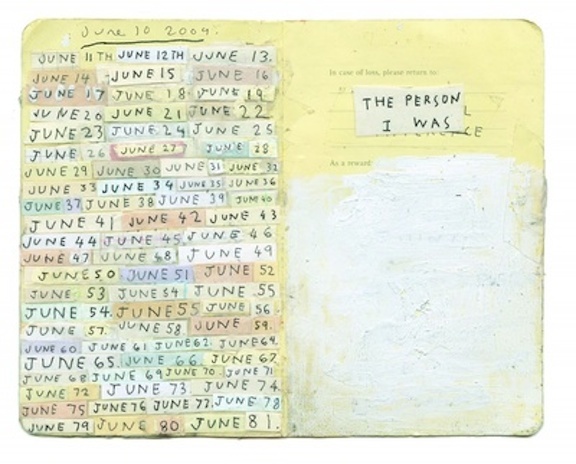 Though the impulse to set personal experiences to the pages of a diary has a long literary tradition, a far smaller number of artists have taken up the practice of encapsulating the minutiae of daily living, or simply recording its passage (as did Hanne Darboven with her Leben/Life series) through visual means. The ten artists in Day After Day don’t so much record the passage of time, but capture its contents (and discontents). The impulse to reconstruct and contain memory is this exhibition’s common thread. Each artist has created a unique means of bearing witness to their own lives. Though the days recorded aren’t without pain and struggle (and in some cases, a purposefully honest look at banality), they also serve as reminders that each day matters. The exhibition’s curator, Corinna Ripps Schaming, puts forth the idea that the diaristic impulse becomes the means by which these artists capture and even give shape to their own experience— and, according to the exhibition statement, ”affirm the human stuff of everyday existence: tears, yearnings, missteps, family obligations, rituals, routines.” Further, Schaming added that she has “always been interested in our quotidian existence and how artists reconstruct memory on their own terms. Other artists break away from the bookish formats of diaristic record-keeping altogether. A striking example of this is Laurel Nakadate’s large photographs, in which she captured herself before, during, and after crying, every day for a year. This was a response to, as she wrote, the “happy self-portraits people make day after day … and post on Facebook.” These are the public faces we’ve all been trained to create and display, even as they veer so far from what is true. Meridith McNeal chose the format of large, strikingly detailed watercolors created during an art residency at the American Academy in Rome, creating not only a sense of place, but the artist’s state of mind while in that place, so far from home. The experience of getting inside these artists’ minds evoked a variety of responses from this viewer, including knowing laughter, compassion, sadness, and above all, empathy. Though we’re not actually sneaking peeks at someone’s diary, this exhibition still can provide a sense of furtively entering secret inner worlds—worlds which, after all, aren’t so different from those within anyone who honestly embraces their own humanity, foibles and all.